Locke is a 2013 British–American drama film written and directed by Steven Knight. The film stars Tom Hardy in the title role, the only character seen on screen, as he carries on a number of speakerphone conversations with characters voiced by Olivia Colman, Ruth Wilson, Andrew Scott, Ben Daniels, Tom Holland, and Bill Milner. The film premiered at Broad Street in Westside, Birmingham at the 70th Venice Film Festival on 2 September 2013. The film had a limited release in the United Kingdom beginning on 18 April 2014, and grossed $5 million worldwide. Locke received critical acclaim, particularly for Hardy's performance, which won him the Los Angeles Film Critics Association Award for Best Actor. The evening before he must supervise a large concrete pour in Birmingham (the largest non-nuclear facility concrete pour in European history), construction foreman Ivan Locke learns that Bethan, a colleague from a job in Croydon with whom he had a one-night stand seven months before (which resulted in her becoming pregnant), has gone into premature labour. Despite his job responsibilities and although his wife and sons are eagerly awaiting his arrival home to watch an important football match, Locke decides to drive to London to be with Bethan during childbirth. Locke never forgave his father for abandoning him as a child, and he is determined not to make the same mistake, even though he has no relationship with, nor any particular feelings for, Bethan. Over the course of the two-hour drive from Birmingham to London, Locke holds a total of 36 phone calls with: his boss Gareth; his backup work colleague Donal; Katrina – his wife of 15 years – to confess his infidelity; his sons, Eddie and Sean, who call him separately with updates on the match and (eventually) the worrisome breakdown of their mother; St. Mary's maternity unit medical personnel, Sister Margaret then Dr. Gullu, who are working with Bethan through some troubling complications; the council head, Cassidy, and local police authority, PC Davids, required for the road closures needed to allow the 225+ concrete trucks to properly access the site; and with Bethan to reassure her during her labour. During these calls, he is fired from his job, banned from his house by his wife, and asked by his older son to please return home. He coaches his assistant Donal through preparing the pour despite some major setbacks, and has imaginary conversations with his dead father, whom he envisions (unseen onscreen) as a passenger in the car; he berates his father for abandoning Locke's family, and vows he will not repeat that mistake. When he is close to the hospital, Bethan calls to share the cooing of the baby, having had a successful birth. Almost the entire film takes place within a BMW X5, which was pulled down the M6 motorway on a low flatbed trailer for most of the shoot. Shooting took place in real time, over just eight nights, with the crew only taking breaks to change the three cameras' memory cards. Ivan Locke is the only character to appear onscreen; the others are only heard on the vehicle's speakerphone, with their parts also recorded in real time (Locke's vehicle and road noise included) as they called from a conference room that served as the multiple "locations" of the various characters. Locke was shown out of competition at the 70th Venice International Film Festival as well as the Spotlight program in the 2014 Sundance Film Festival. It was released on 18 April 2014 in the United Kingdom, where it earned $3,264,654. On 25 April 2014 it opened in the United States and earned $1,375,769. The film was released on Blu-Ray and DVD on 12 August 2014. Hardy (pictured at the film's premiere) received critical acclaim for his lead performance. Rotten Tomatoes reports that 90% of 205 surveyed critics gave the film a positive review; the average rating is 7.68/10. 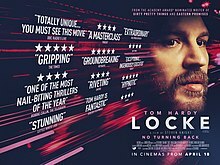 The critical consensus states: "A one-man show set in a single confined location, Locke demands a powerful performance – and gets it from a never-more-compelling Tom Hardy." The film has a score of 81 out of 100 on Metacritic based on 37 critics, indicating "universal acclaim". Olly Richards of Empire awarded the film 4/5 stars and said: "There are films to see on huge screens, but this is one that almost cries out for a small cinema, surrounded by total blackness. It's a daring experiment brilliantly executed, with Tom Hardy giving one of the best performances of his career". In his book How to Watch a Movie (2015), David Thomson singles out this film and says: "No film I've seen in recent years is more eloquent on where we are now, and on how alone we feel. There is little left but to watch and listen." 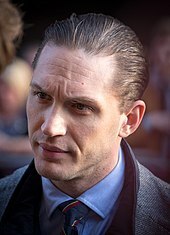 For his performance, Hardy won the Best Actor Award from the Los Angeles Film Critics Association. ^ a b "Locke (2013)". British Film Institute. Retrieved 4 August 2016. ^ Setoodeh, Ramin (25 April 2014). "Tom Hardy Talks About His Experimental Indie Movie 'Locke'". Variety. Retrieved 30 April 2014. ^ a b c "Locke (2013)". Box Office Mojo. Retrieved 14 October 2014. ^ "Lock (2013) Foreign". Box Office Mojo. ^ a b Murphy, Mekado (23 April 2014). "A Road Movie, but With No Rest Stops". The New York Times. Retrieved 28 July 2014. ^ Thomlison, Adam. "Q & A". TV Media. Retrieved 25 June 2015. ^ "Out of Competition". labiennale. Archived from the original on 28 July 2013. Retrieved 26 July 2013. ^ Glasby, Matt (14 April 2014). "Locke". Total Film. Retrieved 28 July 2014. ^ "DVD Releases". Tribute.ca. Retrieved 28 July 2014. ^ "Locke (2014)". Rotten Tomatoes. Retrieved 17 August 2014. ^ "Locke". Metacritic. Retrieved 26 April 2014. ^ Richards, Olly. "Locke". Empire. Retrieved 26 April 2014. This page was last edited on 23 April 2019, at 06:52 (UTC).